The lifts were performed in December and finished in January. 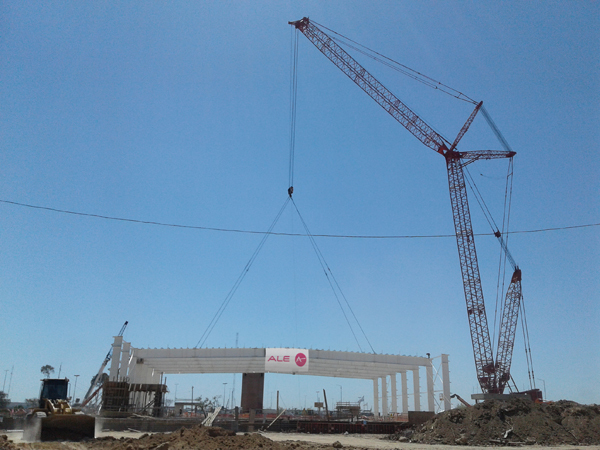 ALE installed six sections, weighing up to 50t, as well as a springboard and steel structure, using a 600t Manitowoc 18000 crawler crane with a luffing jib and 30.5m mast. By deploying this crane, which is slightly smaller than other crane options, ALE delivered a more efficient configuration that was ultimately more cost-effective for the client. Due to time restrictions, ALE had to work to a strict schedule and were able to assemble other lightweight parts as well. Alejandro Gil, ALE project engineer said: “We were chosen following our previous success with roof lifts across the Latin American region and for the alternative lifting solution we proposed, which minimised costs to the client. The roof is part of the Parque Roca stadium that will host the Youth Olympic Games in October 2018.